When Was The Last Time You Had Your Chimney Swept? 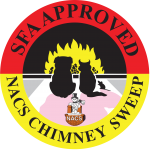 I am a fully qualified and insured, HETAS-approved chimney sweep, plus I am a Member of the National Association of Chimney Sweeps. Give us a ring on 07834 640989. Please bear in mind I may not be able to answer straight away, so leave a message or send us an email instead. Send us a message outlining your requirements (type of chimney, where you are etc). and we will get back to you shortly.